This article is about the band named Straylight Run. For the album of the same name, see Straylight Run (album). Straylight Run performing at the 2009 Soundwave festival in Sydney, Australia. Left to right: John Nolan, Shaun Cooper, and Will Noon. Straylight Run is an emo band based in Baldwin, New York. The band has released two albums, Straylight Run and The Needles the Space, as well as three EPs, Prepare to Be Wrong, About Time, and Un Mas Dos. In 2010, the band announced that they would be going on indefinite hiatus, but might reunite in the future. Two of the members, John Nolan and Shaun Cooper, are currently in Taking Back Sunday. When he was still a member of Taking Back Sunday, John Nolan wrote several songs that he didn't feel would go well with the band. After their departure, John and Shaun Cooper recorded several demos with Taking Back Sunday drummer Mark O'Connell. The band began to take its present form when drummer Will Noon was invited to join after his former band, Breaking Pangaea, broke up. Breaking Pangaea's former lead singer was Fred Mascherino, who later took Nolan's place in Taking Back Sunday. Shortly thereafter, John's sister, Michelle DaRosa, joined Straylight Run. The band gained popularity after posting six demo songs for free download on their official site. By September of that year, they were playing to sold-out crowds in various cities in the Northeastern United States. The band's name was taken from the final section of William Gibson's cyberpunk science-fiction novel Neuromancer. Due to John's and Shaun's involvement in their previous band, they were bound by contract to release an album under Victory Records. They began to record their first album in April 2004 and released their self-titled debut album Straylight Run on October 12, 2004 after a one-month postponement. The album sold over 11,000 copies in the first week, and made the Billboard Top 100 Albums list. The album featured Nate Ruess, former lead singer of The Format and current frontman of the indie-pop group fun. on the song "It's For the Best". In late 2005, the band toured with Simple Plan. On October 4, 2005 the band released their second record in the form of the Prepare to Be Wrong EP. The CD comprised two old demos ("A Slow Descent" from the band's original demo, and "It Never Gets Easier" a demo from the sessions for their first CD Straylight Run, although it was then known as "Costello"), a cover of Bob Dylan's "With God on Our Side" and 3 new songs. The CD ended their contract with Victory Records. Plans for a live DVD were in the works but were shelved. On June 19, 2007 the band released their second album, The Needles the Space, under Universal Records. On December 8, 2007 the band was dropped from Universal Records. The band toured in support of Bayside in February and early March, 2008. The band toured in support of The Used on the inaugural Get a Life Tour from March 31 through May 11, 2008. On June 3, 2008 Michelle DaRosa announced that she would be leaving Straylight Run to pursue a solo career. In her MySpace message, she left the door open to rejoining the band at some future time. 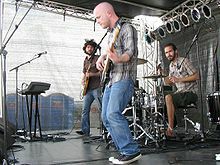 In late 2008, DaRosa formed the band Destry which also featureed Sam Means of the indie rock group The Format, as well as Shaun Cooper from Straylight Run. On June 10, 2008 the band entered the studio for pre-production on their next CD, an EP entitled Un Mas Dos. While the band made the three songs available on the EP available in streaming format through MySpace and other means, and began selling digital download cards at its tour beginning September 9, 2008, on September 16, 2008 the band released the album in a digital format. A vinyl format is also available. After two tours in late 2008, the band played at the Soundwave Festivals in Australia in February and March 2009, as well as two shows with Minus the Bear. The band then planned to do further recording, towards another EP. In May and June, the band went on tour with Lovedrug and Good Old War. In February 2010, Straylight Run announced they were going on an indefinite hiatus due to financial complications. John Nolan stated that he would continue his solo act, and was not against the idea of returning to Straylight Run. Shaun Cooper wrote a blog saying that he was retiring from touring, thanking Straylight Run and also thanking Taking Back Sunday and saying he is really proud of the work and success they have accomplished. On March 31, 2010 it was confirmed that John Nolan and Shaun Cooper had returned to Taking Back Sunday. On June 4, 2011, Nolan and Cooper teamed up with Taking Back Sunday drummer Mark O'Connell to play a show at Rogue Live Studios in Hicksville, NY, with their set featuring six Straylight Run songs. Nolan pointed out before the last song of the set, "Existentialism on Prom Night," that O'Connell was a member of Straylight Run for a brief time at its inception, before choosing to remain with Taking Back Sunday. "It’s Everybody’s Fault But Mine"
"The Tension and the Terror"
2004 "Existentialism on Prom Night"
2005 "Hands in the Sky (Big Shot)"
2007 "Soon We'll Be Living in the Future"
The track "Hands In The Sky" was featured in the Sons of Anarchy season two episode "The Culling". The track "Existentialism on Prom Night" was featured in season one of the show Against the Wall. ^ "Michelle Nolan takes hiatus from Straylight Run". Alternative Press. Alternative Press Magazine, Inc. June 3, 2008. Retrieved July 10, 2017. ^ "Straylight Run / Lovedrug / Good Old War to tour". Alternative Press. Alternative Press Magazine, Inc. April 23, 2009. Retrieved August 8, 2017. ^ "Straylight Run Hiatus van Straylight Run op Myspace". Blogs.myspace.com. 2010-02-16. Archived from the original on 2010-02-21. Retrieved 2011-07-06. ^ "New-Self Titled Album Available Now". Taking Back Sunday. Retrieved 2011-07-06. ^ "John Nolan, Shaun Cooper, Mark O'Connell". YouTube. 2011-08-09. Retrieved 2012-01-31. ^ "Straylight Run Returns in September - News Article". AbsolutePunk.net. Retrieved 2011-07-06. ^ "Straylight Run Title New EP - News Article". AbsolutePunk.net. Retrieved 2011-07-06. ^ "FMQB Airplay Archive: Modern Rock". Friday Morning Quarterback Album Report, Incorporated. Retrieved October 30, 2016. This page was last edited on 21 March 2019, at 05:26 (UTC).